Will we or won’t we get our car back today? Finding out is an effort in itself as there is no phone signal for ten miles and we have to resort to using the telephone box for which the minimum charge per call is 60p. I am sure it was 2d last time I used one. At 11.00 we are to ring back at 3.30. We decide to be optimistic, pack up the van ready to hitch up and start to head for Skye in the courtesy car, intended to ring as soon as we have signal and turning round if our car is not finished. So we head over the bridge to Skye for the third and in this case unscheduled, time. We top the courtesy car up with petrol. Strangely, the more petrol we put in, the lower the petrol gauge seems to go. Confident that we must have returned the contents of the tank to the required level, notwithstanding what the gauge suggests, we seek an opportunity to contact the garage. Unfortunately phone signal and potential passing places do not coincide. As soon as we spot a signal indicating bar appearing on the phone screen we pull in to a turning, as the road is too narrow just to pull up. Immediately we do so the bar flickers and disappears. This happens several times before finally signal and parking opportunity coincide and we are told we can collect the car in an hour and a half’s time, at 5.30. At this point we realise that we really should have eaten our main meal in the middle of the day. We use the spare time before car collection to acquire some very good fish and chips from Portree harbour, highly recommended. It is raining, what a surprise, so we have to eat these in the car. This means that we have to continue our journey with all the windows open in an attempt to alleviate the smell of fish and chips. We find the garage and there is our beloved car minus its wheels. Correction, it is Chris’ car. When I see the size of the repair bill it is most definitely Chris’ car. Wheels affixed, we set off, hoping to get to Grantown-on-Spey tonight, some 150 miles away from the garage on Skye. We make good time back across Skye to the caravan site. Van attached and we feel our holiday is back on track. Five miles up the road and the car begins to sound like a jumbo jet, there is also a rather alarming smell of burning paint. Admitting defeat we limp back to the site we have just vacated and settle in for the night. The next day we return to the phone box for another call to the recovery services. Whatever is wrong seems unrelated to the previous problem and we are told the car will get us home. Ok, I’ll admit, there was no mention of when. I am not clear on the nature of the problem in technical terms – something to do with thrusts or turbos. In practical terms our top speed is 50mph and that’s going downhill, uphill is a very noisy 30mph. This is the highlands of Scotland. The clue is probably in ‘high’; there are a lot of hills. Chris is convinced that it is ‘all downhill’ on the way home; I am sceptical. We have 642 miles to go and Bank Holiday traffic is looming, deep joy. We begin the journey home as soon as we can, at midday. The weather is that typical Scottish combination of beautiful sunshine one minute and rain the next, although this is probably the best weather we’ve seen for a fortnight – inevitable really. We nurse the car southward, including along past Loch Lomond on a route that we have not traversed previously. After 150 miles and 4½ hours of annoying the traffic behind us we reach our first dual carriageway. We arrive in Glasgow for rush hour. Signs warn us that progress will be slow for seven miles, or in our case four hundred and seventy seven miles. Our not recently updated satnav doesn’t recognise this bit of road. We decide to ignore her instruction to ‘turn around where possible’ in the middle of the M74. We finally give up at Carlisle but at least we are back in England and the site has a television signal so we can watch Who Do You Think You Are? An early start the next day as we still have 375 miles to go and the sooner we reach the south west peninsula the more likely we are to miss the worst of the weekend get-away traffic. The weather is glorious – no comment. Now we have motorway we can manage a steady 50mph, when the road works, traffic jams and accidents allow. On spotting a caravan that has come adrift from its towing vehicle on the M6, fortunately it seems without injuries, we realise that we could be worse off. In fact looking at the traffic heading north, which is solid from Manchester to Tewkesbury, we could be a great deal worse off. Getting through Bristol, eight hours in to our journey and during the rush hour build up is time consuming. Beyond Bristol things improve for us but there are clearly still serious north bound delays. At last we are thirty miles from home and the end is in sight when we see the dreaded ‘road closed due to accident diversions are in place’. Said diversion was up a narrow (narrowish – our caravan passed another going in the opposite direction without mishap) road and our convoy is being led by someone who has clearly never driven on anything more slender than a motorway. Their response to being on a road with only four foot on either side of their vehicle is to drive at twenty miles an hour; at least we are no longer getting the blame for impeding the flow of traffic. This diversion puts another hour on what has already been a ten hour journey. I reflect that, in the past, ten hours to travel the length of England, without getting wet or saddle sore, would have seemed like a dream; sadly though I have twenty first century expectations. At least I am compensated for the debacle and missing what promised to be some of the ‘best bits’ of the holiday by the fact that half my family are waiting to greet me at home. I have gate crashed their time in Devon but at least I can enjoy being a Granny. Another wet and windy day in the van waiting for the garage to not mend our car. We have an amended plan here on in but it depends on our car being available the day after tomorrow and there are no guarantees. Ah well, I do manage to make progress with the Braund Society Journal whilst stuck in the van. The next day we decide we really should do something. First, in to Kyle of Lochalsh to find a cash point and get some food. There is a very tiny general store and meat comes from the butcher’s next door. We show ourselves up by being unsure of the weight of the mince that we require. I hate to admit that we normally grab pre-packaged mince in a plastic box that looks the right sort of amount, without being aware of its weight. In this area there are plenty of road signs exhorting us to drive on the left. This of course is for roads that have space for two vehicles to pass and given the number of European tourists, may well be necessary. We head north across the breathtaking countryside that is Wester Ross. We have chosen a destination somewhat at random and are aiming for Torridon Countryside Centre. The weather is what we have come to expect of Scotland, raining one minute and sunny the next. Along the Wester Ross Coastal Route we encounter a sign to Stromferry. Helpfully, the sign warns that there isn’t actually a ferry at all at this location. We have seen many abandoned and ruined crofts, either a relict of the ‘clearances’ or signs of where a more recent crofter has found themselves unequal to the demands of life in the remote highlands. On arrival at the Countryside Centre, we are able to watch a short film about the flora and fauna of the area. Accompanied by an evocative smell of pine, we walk down to the small deer museum and park, where we can see captive Red Deer. There are meadow pipets and curlew and as ever, rowan trees (Mountain Ash) full of berries. As the year progresses and we get further north, the Rosebay Willow Herb that has been prolific since the Lake District is finishing and the heather is becoming more noticeable. We take a slightly longer way home to avoid retracing the whole of our route. 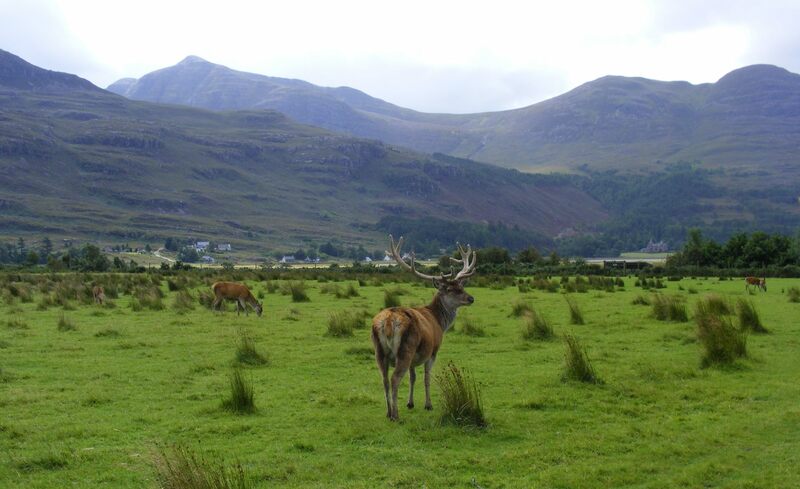 Firstly, along Glen Torridon, alongside the towering Beinn Eighe range, then through Glen Docherty and Glen Carron. Here we re-encounter the convoy of Italian camper vans that we first met at Killin. Here also our first close up view of a wild, full grown, male red deer, unfortunately not in a position where we could take a photograph. Our car is still being described as ‘a work in progress’, which is less than helpful and may mean that the revised plans require further revisions. After our exploits on Uist we spend a day recovering in the van; the stormy weather making this an attractive option. The following day we are still marooned in Kintail and the weather is no better. Although we would rather not have had our plans diverted, there is some comfort in realising that this is the day we should have been on a boat going to Orkney. The weather is reputedly worse further north. It remains to be seen if we will get there but if we do the conditions can only be better. We decide that we will take our courtesy car eastwards to seek out monsters in Loch Ness; maybe our form for wildlife spotting will improve. In rain and mist we pass the site of the battle of Glen Shiel, which took place in 1719 when the Jacobites and their Spanish mercenary allies fought the British troops. This was the last time that the British army faced foreign troops on British soil. We view Loch Ness through wind and rain. We drive further up the loch to Drumnadrochit, planning to utilise the car park of Castle Urquhart, which we can enter free, in order to photograph the loch. Here we encounter numerous foreign tourists on their ‘every possible castle in Scotland and then some’ coach trips and the car park is full. Fortunately someone is just departing and we slot in to their space. Although it wasn’t on the itinerary, Castle Urquhart (bizarrely pronounced Uff-irt) is an interesting location and yet another example of serious investment in Scottish tourism, with an impressive visitors’ complex. Apparently, this met with local opposition when it was proposed in the 1990s and it is set partly underground to minimise the impact. Like everywhere else, the staff are very friendly and we are greeted by two members of Clan Grant in ceremonial dress. We are asked where we hail from and they decide that Devon just about qualifies us for entry. We are probably more local than 90% of today’s visitors; rain is doubtless keeping the less intrepid British holidaymakers indoors. We are herded in to watch a well put together video presentation about the history of the castle. In the sixth century, Saint Columba visited the Pictish chieftain Emchath, who owned the fortress on this site, and converted him to Christianity. 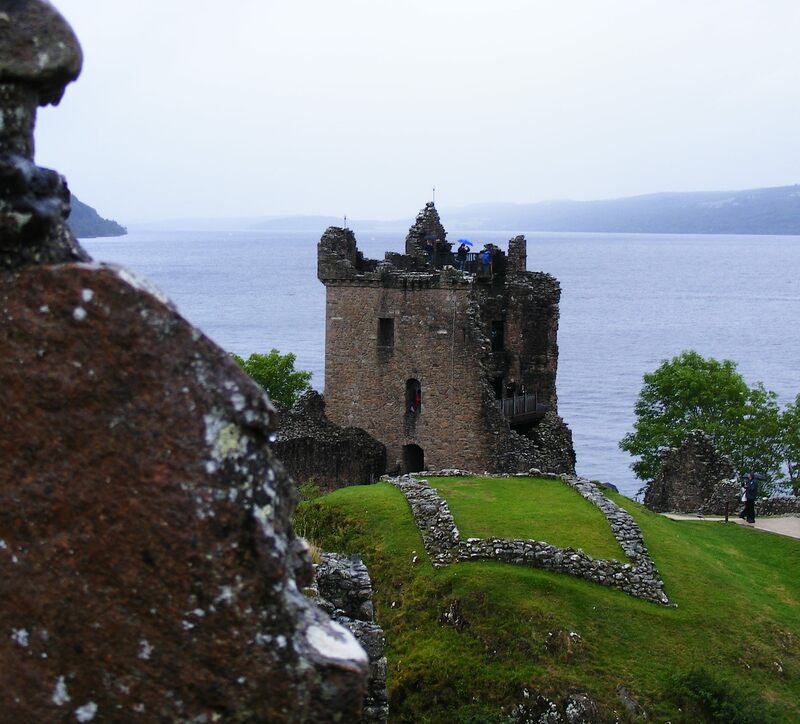 Sir Alan Durward built the stone Urquhart Castle in 1230. Edward I captured Urquhart in 1296, during the wars of Scottish Independence but it was soon regained. In 1395 it was seized by Donald, Lord of the Isles, seeking to increase his power. In 1509, James IV stripped the MacDonalds of their land and titles and gave Urquhart to the Grants. Raids by the MacDonalds continued. In 1545, they captured 2,000 cattle and many other animals, as well has taking furniture, cannon and the castle gates. In 1689, the Grants supported William and Mary and there was an unsuccessful Jacobite raid on the castle. Nonetheless the Grants abandoned the castle, firing the gatehouse so that it could not be taken over by their enemies. Grant was compensated by Parliament but although they retained ownership until 1912, the castle remained in ruins. Much of the interpretation for this castle, one of the largest in Scotland, are of the ‘this may have been’ nature. Amongst the remains is what’s left of a ‘Doocot’, or dove-cot, which John Grant was obliged to build as a condition of his being granted the castle in 1509. There is a full size trebuchet in the grounds, accompanied by the proviso that there is no proof that one was ever used at Urquhart. What next, a nuclear war head complete with a similar caption? Having done enough to feel that we haven’t wasted the day, we retire to the van to watch the European athletics championships. I wake up early as usual. This is just as well as we need to leave the van at 7.00am and something weird has happened to my alarm clock, which thinks it is still 1.00am, so it would have been no good relying on that. What more can go wrong? We drive across Skye to Uig. Chris is convinced that this is pronounce ‘You-eee’ and he has been here before so who am I to gainsay him. I would like to place on record that we were not first in the ferry queue, nor indeed, second or third. The ‘Hebrides’ ferry arrives with a distinctly worrying tilt to starboard. We can only hope that this does not have a detrimental effect on our voyage. We are bound for North Uist and by the judicious use of bridges, will be able to visit five islands for the price of one. Okay, so it was quite a substantial price but there are only two return ferries and one of those leaves five minutes after we arrive. The other is later than we might have chosen but it does mean that we will have plenty of time to explore. On the journey across, we see, ranged across the skyline, the myriad of rocks that make up the tiny islands of the Outer Hebrides. From a distance, they resemble the humps of the fabled Loch Ness monster. I have brought my laptop with the intention of finishing the Buckland Brewer History Group newsletter whilst on board and make good progress. As the ferry draws in to Lochmaddy we see notices that instruct us to ‘wait for instruction to move before starting engine’. How difficult can this be? Very difficult it turns out, as most of our neighbours are turning their ignitions before the ferry’s ramp is lowered. North Uist, where we land, is distinctive, much flatter than Skye, with many inlets and stretches of water. At last heather is in abundance. I opted to visit this chain of five Outer Hebridian islands, rather than Harris and Lewis, primarily because I liked the sound of Benbecula. First stop is the island of Berneray, so we head north. Like much of Skye, this is single track road with passing places, involving much slowing down and changing of gear. The road is blocked by a van pulling a trailer containing a digger. We wonder why they are hunting around in the ditch instead of moving out of the way. Ah, they are searching for one of their trailer wheels, that explains a lot. The mobile bank arrives as we draw up at the only shop on Berneray. Chris attempts to get them to part with money but they can only cope with Royal Bank of Scotland customers. We call in at the Berneray Heritage Museum in the old nurse’s house, given to them by the council for a peppercorn rent when the district nurse was discontinued. Worryingly, there were not only problems with the paperwork relating to the original purchase of the building but also with the lease, so they may be on borrowed time. We learn that kelp gathering and horse breeding were the staple industries here. Of a 1911 population of between 500 and 600, 86% were Gaelic speakers, although schooling was in English. Each child took a piece of peat to school every day for the fire. 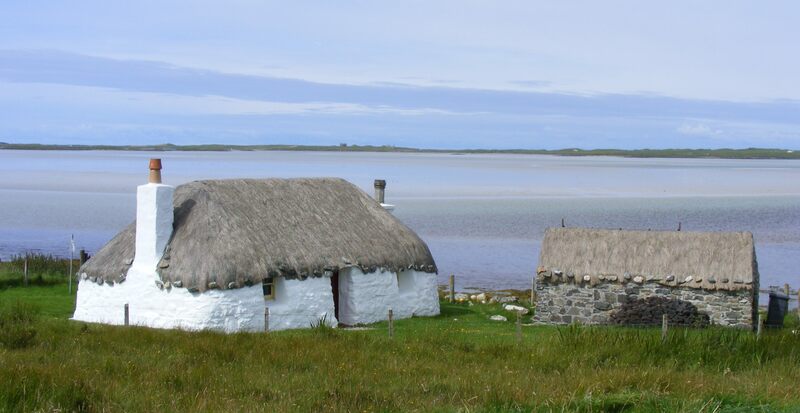 In the 2011 census one Berneray resident from the 1911 census was still on the island. The museum even has a photo of a yacht that Chris’ Devonian grandfather crewed, along with men from the Western Isles. We learn of Angus MacAskill, born on Berneray in 1825, who is accepted as being the world’s tallest man ever at seven foot nine inches. We ask about some of the traditional ‘black houses’, which here have a roof that slopes down inside the line of the front and back walls, leaving a shelf like projection at the top of the wall. We are told that this is to deflect the rain so that it doesn’t drip on those leaving the dwelling. This doesn’t seem very logical to us as surely this makes the walls more vulnerable. The island location means that there is rarely snow here so roofs do not have to cope with that. 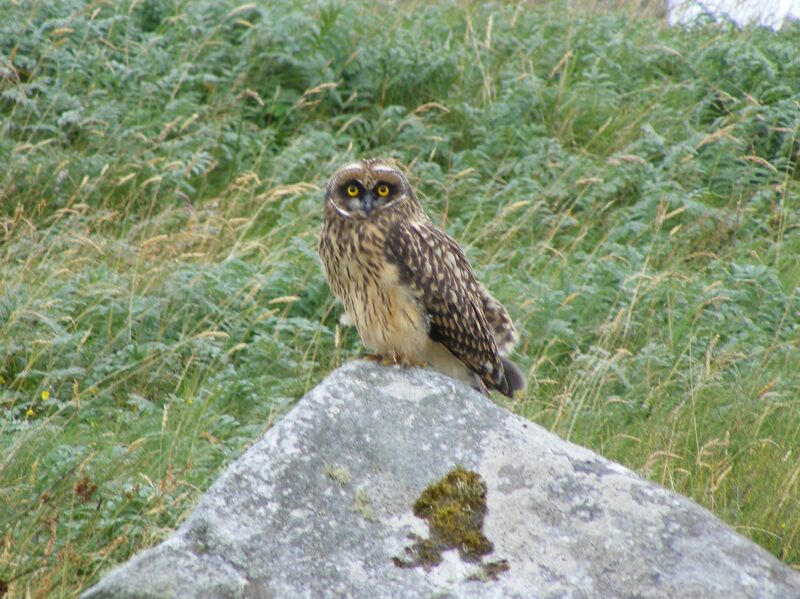 Back on North Uist we somehow miss the RSPB reserve but nonetheless see lapwing, hear curlew and manage to take a photo out of the car window of a short-eared owl sat on a rock. Our progress is hampered by playing dodge the sheep on the narrow road. We stop at the ruined Trinity Temple, allegedly Scotland’s oldest university. It was a medieval monastery and college founded by Beathag, daughter of Somerland. After an extension in the sixteenth century, it was dissolved during the Reformation, although there were later repairs. On leaving the museum, we find that we no longer have to worry about the clutch being overheated; there is no functioning clutch. We have to abandon plans to reach Eriskay, the southernmost island of the chain, noted for its wild ponies and the wreck of S.S. Politician in 1941. The vessel was laden with 260,000 bottles of whisky and its story became the basis for the book and later film, ‘Whisky Galore’. We limp back towards Lochmaddy, attempting to do so without stopping or changing gear, next to impossible on a single track road. In the middle of absolutely nowhere we find a lorry servicing garage. The mechanic confirms the demise of our clutch. The good news is that he can fix it on Tuesday. It is Friday. If that is the good news I don’t want the bad. We are four islands away from our caravan and several miles from anywhere where we could potentially sleep or obtain food. I have only had a lemon muffin since 6.00am and even Chris’ full English breakfast on the ferry is a distant memory. Now comes the very long wait while the recovery service try to work out if they can indeed recover us. Chris is patiently spelling out our current location, once we confirm where that is, where we have to get to, via where and most importantly by when. We really need to get that ferry back to Uig. I’ll admit it, I am hopeless at doing nothing. I could read my Kindle but the battery is low. I could use the laptop – ditto. What about good old pen and paper. I can manage the former but the car is lacking in anything to write on. Finally I locate a single A4 printed receipt that I took to exchange for our ferry tickets. If I write very very small I can occupy myself for a while using that. I need something to stem the rising tide of panic, made worse by the fact that we have very little cash, thanks to not being RBS customers and that Chris’ phone battery, like every other battery in our possession, is getting very low. I know, I know, this is a time when I need my ‘emergency phone’; inevitably it is back at the caravan. After what seems forever, recovery truck one arrives. The car is loaded and the driver ferrets around in the back for something resembling a seat to put in the middle of the cab for me. This ‘seat’ doesn’t rate a seat belt but this seems not to matter. I am sandwiched between a broad Devon accent and a broad Gaelic accent, acting as interpreter but truth be told, I could only follow half of what our rescuer was saying. I did catch the bit when he said he though his clutch was going but I ignored that. In the process of getting the car on the truck it was apparent that no way was our car going anywhere, like on a ferry, unaided. Understandably, our driver would rather not have to tow us on and become marooned on Skye overnight. Not to worry, this is the Outer Hebrides, everyone knows everyone. In the queue there is a random van, with someone known to our driver at the wheel. He is approached to tow us on and off the ferry and our driver even donates a tow rope as a souvenir. I look pathetically at the dispatchers, not difficult as I am both sleep and food deprived and they agree to load us as a towed vehicle, by no means a foregone conclusion. Despite our lack of automotive capacity we are on the ferry. The ferry is half an hour late arriving and all we want to do is get home but finally we are aboard. After consuming the welcome curry from the café, there was the issue of getting off the ferry. Our helper accelerates away at a great rate and the tow rope snaps. We tie it together but it was short to begin with and now Chris is very close to the almost new van in front. He manages to avoid running in to it and we are handed over to recovery truck two. We are on Skye, this driver drives at Skye speeds. I do have a seat belt this time but as he hurtles round the many twists and turns our knuckles are whitening rapidly. We arrive at the garage, deposit the car and collect a courtesy car that has been left out for us. We are still an hour and a half from ou destination. Arriving back just before 1.00am, I don’t think we have ever been so pleased to see the van. Now we have to work out how to cope when we are fifteen miles from a shop or a phone signal and fifty miles from our car. Thank goodness for the internet connection. Working out what needs cancelling or rearranging in order to get our trip back on track can wait until morning. We travel over the bridge to Skye without any bonnie boats, or indeed birds on wings, in sight. 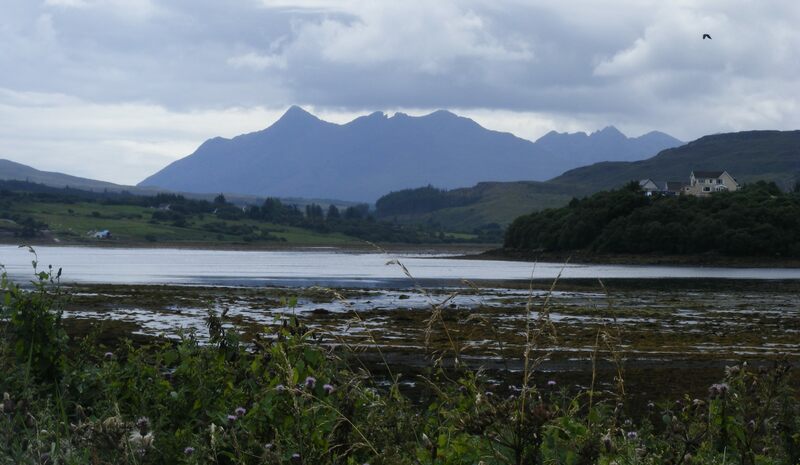 Skye, once voted one of top five island in the world by National Geographic magazine, is living up to its Gaelic name, Eilean a’ Cheo – Misty Isle – so the tops of the Cullins aren’t visible. We head to a hide at Kylerhea, supposedly the place to see otters, unless of course you are us. Any potential otters are a good way away out to sea. We think they are otters but I am still not totally convinced that they aren’t seals. We do definitely see a number of those. Using binoculars is always tricky when one wears glasses and today is no exception. I end up with a squint and round rubber marks on my glasses. Historically cattle from Skye were swum across the 550 metre channel to Glenelg in groups of six or eight. They would be roped in a line behind a boat and rowed to the other side before being walked to market. There don’t see to be many cattle left; there are more sheep. Of course tourists are now the bedrock of Skye’s economic activity and there are plenty of those, the bridge making it easy for coaches to travel across in great numbers. They and many other vehicles, seem obliged to go at ridiculous speeds, hurtling past us at the most inappropriate points. We travel north to Colbost, spotting a stranded campervan on the way. The driver has parked on a soft verge and the nearside is now significantly lower than the offside. Having no method of offering assistance we leave the owners telephoning the recovery services. 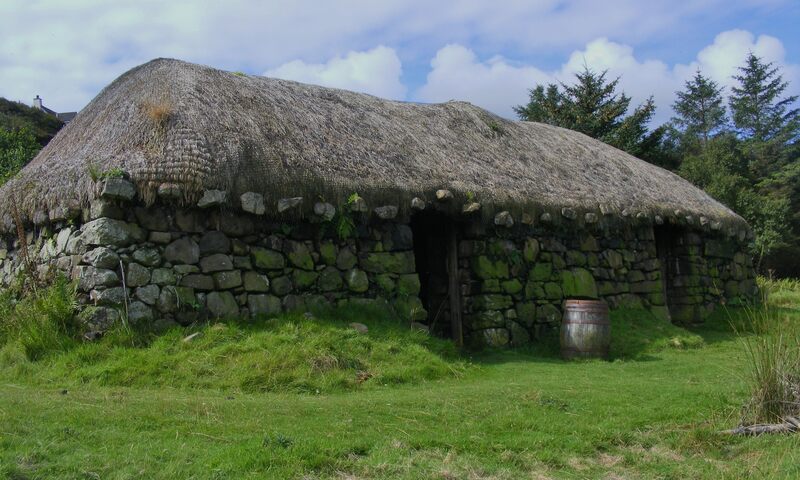 At Colbost we can see a traditional Skye ‘black hut’, a stone built, two roomed dwelling, with no windows or chimney. There is a central fire and a typical boxed in bed. Animals would have been kept in one end and humans would inhabit the other. The roof would be rush or bracken. Today the rushes are held down with chicken wire and this is weighted by large stones being tied round the edge, rather like the corks on the stereotypical Australian hat. I guess, in the era pre-chicken wire, a net may have served the same purpose. The croft even has the remains of an illicit whisky still behind it. We travel on to Portree, grabbing the last space in the car park. I narrowly avoid being mown down by a bus. It appears that the whole of Skye is in the throes of a power cut. We had seen so little habitation so far that we hadn’t noticed. A swift walk round Portree and we return to the mainland across the barren hillsides of Skye. It is beautiful and rugged here and somehow different from the mainland in an indefinable sort of way. We shall be back tomorrow en-route for the Outer Hebrides. Disappointingly, ex-hurricane Bertha means that today’s planned sea-fari to Iona has been cancelled. I was looking forward to learning about St Columba and hopefully experiencing a turn around in our wildlife encountering fortunes. After discussing various alternative options, we decide that the conditions really aren’t conducive to any kind of sea voyage, or indeed anything else much. We decide to go to Seil Island to see signs of the slate quarrying industry. This is where we would have picked up our vessel to Iona had we gone. It is accessed by the humpiest bridge I have ever seen. It is single track and as you reach the apex it is completely impossible to see whether or not anything is coming in the opposite direction, fortunately it wasn’t. Just as we are beginning to wonder if our intended destination has disappeared into the same Brig a Doon like black-hole as the ospreys et. al., we arrive at Easdale. It is an interesting settlement and we were surprised to see so many tourists, given its remote location. The closely packed, eighteenth century, two roomed slate workers’ cottages are fascinating. The village boasts a free heritage centre that manages to keep going despite being reliant on donations. There is also the emporium that is ‘Highland Arts Exhibition’. Yes there is ‘art’, some of which is of dubious quality, there is also on sale every bit of Scottish related tat one can imagine. I think who ever is responsible for buying stock must hoover up any remaindered merchandise featuring tartan, sheep or highland cows. Seil’s other claim to fame is that it was the home of Lady Diana’s mother for some years. On our return north the sat-nav directs us via what I dub the ‘Oban by-pass’. Given the amount of traffic in Oban on our outward journey this is a good thing. This route is my sort of roadway, single-track and twisting with occasional passing places. In the interests of obtaining free wi-fi we travel beyond our site, looking for The View & co.. Again it proves elusive. It is said to be in Appin. We investigate Appin to no avail then try Port Appin. Anyone choosing to site a café in Port Appin would be able to place no reliance on passing trade and there is no sign of our destination. Back to plan a) and this time we travel beyond Appin and are successful. This is a lovely café and does indeed have a view, even in bad weather. From here we can see Castle Stalker, built in the fifteenth century and belonging to the Stewarts of Appin. It has nine foot thick walls and was used as a hunting lodge by James IV. In 1620 the castle was lost to the Campbell family. We sink into comfy settees and I try to make a cup of coffee last as long as possible whilst I access the internet. It seems one can make a small cup of coffee last an hour, although I am aided by my fellow traveller who is consuming a generous portion of apple pie and a whole pot of tea. I am there so long that said companion is in danger of dozing off. We decline the opportunity to pay for entry to the Mini Imax wildlife cinema. To be honest we don’t even know what an Imax cinema is. There are in theory live nest cams. On current form, on our arrival all these nests would have been inexplicably vacated and we don’t want to ruin anyone else’s experience. Having inflicted the Commonwealth Games on my travelling companion, he is now enduring the European Athletics Championships and is probably hoping for impaired television access on future sites. The next day, we are loath to leave our sea-side site, with its invigorating smell of ozone. It is a shame that our stay coincided with the even more invigorating ex-hurricane Bertha. We see the sun for the first time in four days and on our journey to Fort William mountains are revealed that had been invisible on Monday. I take a picture of where I think Ben Nevis ought to be. We drive past Loch Lochy and over the swing bridge that spans the Caledonian Canal. The Cluanie Dam is part of the necessary infrastructure for the nearby hydro-electric power plant. The scenery in Glen Shiel is dramatic. The Saddle on our left towers 1011 metres above sea level and there are other peaks of a similar size on the other side of the road. Our new site at Kintail is nestled between the mountains, some of which are the five sisters but I am not sure which ones. Once pitched we head off to visit Eilean Donan Castle. 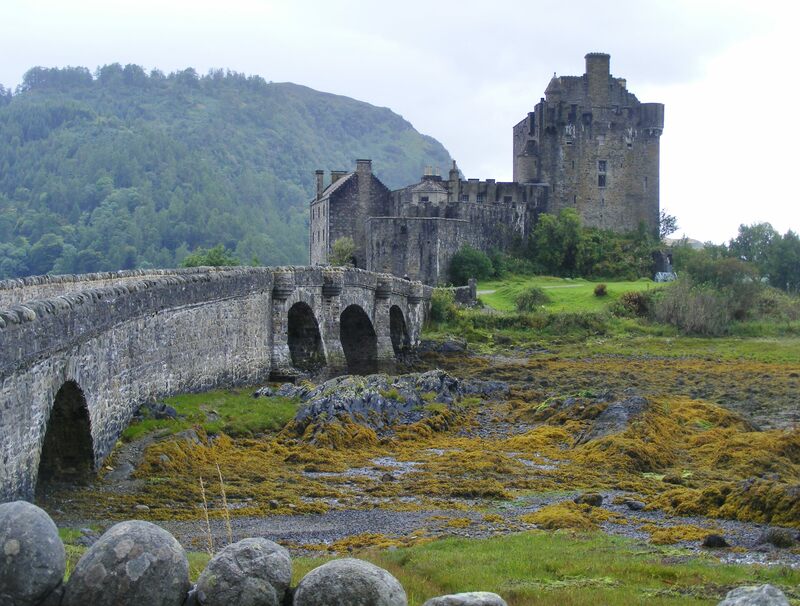 Eilean is Gaelic for island and Donan was a sixth century Irish saint. 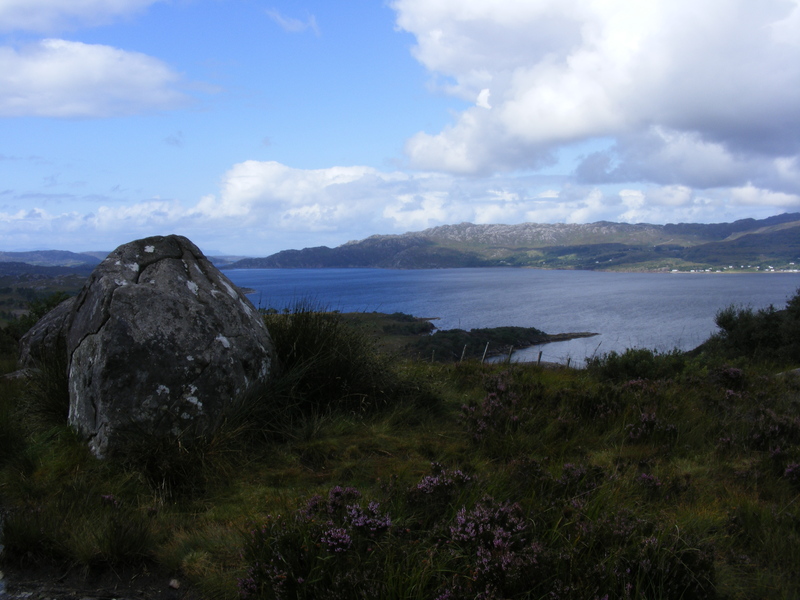 It is sited at the conjunction of Loch Long, Loch Duick and Loch Alsh and was constructed in the thirteenth century to defend this strategically important location against Vikings who it seems were still raiding Scotland at this point. Protection from hostile warring clans was also needed. In 1539, fifty Birlinns (sixty foot, clinker built boats resembling Viking longships, requiring 12 pairs of oarsmen) crewed by the MacDonalds approached the castle, which at the time had only three residents to defend it. The owners of the castle were the related families of MacKenzie and MacRae. The castle was captured by the Jacobites of Kintail in 1715 and became a Catholic stronghold. Locks of hair from Bonnie Prince Charlie and his family are on display. Eilean Donan also had a role in the little known ‘Little Jacobite Rising’ of 1719 when it was the supply base for the Jacobites and a garrison for Spanish mercenaries. The castle was destroyed and it was not restored until 1912, when the then owner, John MacRae-Gilstrap, began a twenty year programme of renovations. Six coaches disgorge their German passengers into Eilean Donan Castle. The advantage of this is that they are getting a special commentary from one of the guides. We do have to listen to this in English and then wait for the German translation but we glean additional information. The effects of what we have been told by weather girl Carole we must refer to as ex-hurricane Bertha have been dramatic. Our wonderful pitch is less than wonderful in strong gale force winds and we are grateful for the Isle of Mull that protects us from the Atlantic breakers. We survive unscathed, although several others on site suffered damage to awnings. My history friends will appreciate that, despite immersing myself in Scottish heritage, there is no substitute for actual research when one is experiencing withdrawal symptoms. We have been tasked with finding out more about an RAF station near Oban, where Catalina sea-planes were based during World War 2. We have seen no signs of a Museum in Oban but drive in to investigate. I was heading for the Tourist Information Office but Chris is tempted to ask about the whereabouts of a museum at the Post Office. He decides that the twelve year old behind the counter is unlikely to know and is saved from making himself seem unobservant as we spot that the Museum is next door! Better still it is a) free and b) dedicated to war-time Oban. We gather some useful information and set off for nearby Ganavan Sands, where the aircraft hanger has recently been demolished in favour of a housing development that looks very much like another second home owner haven. So now historical research lands me on a deserted Scottish beach in heavy rain and conditions that can best be described as ‘bracing’. It was satisfying to be able to take photographs to add to someone’s family history though. We drive north to Fort William through rain and mist. We do spot some strangely orange sheep, looming through the drizzle, on the way. With a bit of an effort we find Morrisons in Fort William for supplies and skulk in the car park so I can tap in to the Scot Rail free internet. As I have a train ticket in my possession I do not feel too bad about this. We locate a car park more suited to a longer term stay and then go to board the ‘Jacobite’ steam train to travel along the Glenfinnan valley to Mallaig; we are situated in Sir Lancelot carriage. The train contains tourists of many nationalities and possibly the loudest Scottish people in the world. I blame the on-board champagne. Even the five year old opposite us complains about their volume. As they were too stupid to book in advance their party have been allocated random spare seats that are not adjacent to each other. This makes matters worse and encourages them to stand in the aisles blocking people’s view. I am a sucker for a steam railway and this is obviously a lovely route. It is just a shame that the weather means we can’t see much of it. We pass ‘Neptune’s Staircase’, a series of eight locks in very quick succession over the Caledonian Canal. Sadly Ben Nevis is another iconic Scottish site that will elude us, as it is hidden from view by the heavy cloud. Here we are close to Glen Coe where, in 1692, the Campbells, whilst staying with the MacDonalds, massacred thirty eight of their hosts. The MacDonalds were, incorrectly, thought to lack the necessary paperwork attesting to their loyalty to new monarchs William and Mary. The Glenfinnan valley is notorious as the spot where Bonnie Prince Charlie raised his standard to herald the start of the ’45 Jacobite Rebellion and we see a monument to the ‘Young Pretender’. 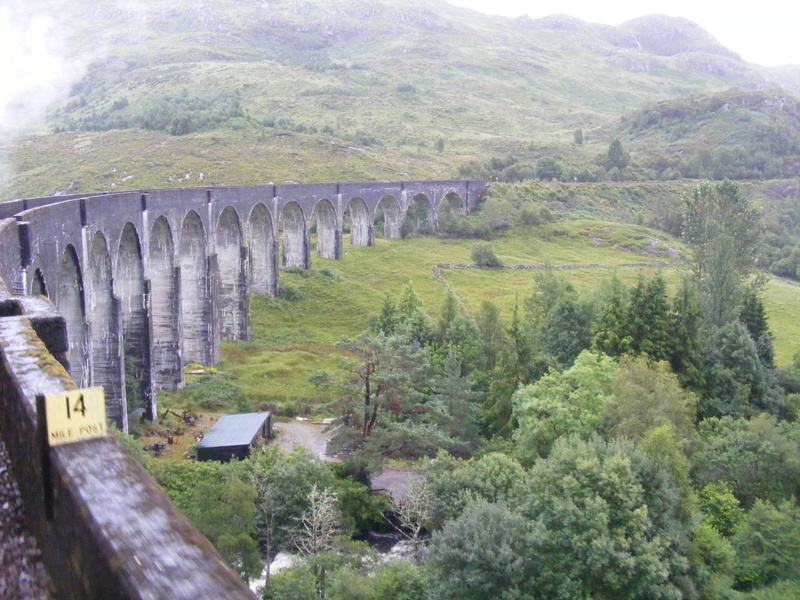 This line was extended to Mallaig in 1901 thanks to a feat of engineering by ‘Concrete Bob’ MacAlpine who constructed the twenty one arch, 1248 foot long Glenfinnan Viaduct, a location that famously appears in the Harry Potter films. We look over Loch Shiel, alias the Black Lake. The stop at Glenfinnan station is just long enough for us to be deprived of fifty pence each in order to be herded through the small museum on the station. Sadly the crowds mean that we cannot take this at our own pace and it is little more than a walk through. Rumour had it that a horse and cart met its fate in one of the viaduct arches during construction. Recently, x-rays have identified remains, not in this viaduct but in that over Loch Nan Uamh, further along the line. We stop briefly at Arisaig, the most westerly mainland station in the UK. Then we have a two hour stop at Mallaig. Normally we would have spent this looking at the town. The Heritage Centre are clearly missing a trick as they close at 16.30 and the train arrives at 16.40. We do brave the wind and rain to briefly inspect the harbour. Even the most dedicated fishing boat observer in our party isn’t keen to prolong this longer than necessary. Fortunately we are soon allowed back on the train to eat our yummy ‘serve it yourself’ salad that we acquired in Morrisons. We nearly went for pre-packed salads but these lacked accompanying implements with which to eat them. Pasta salad doesn’t really lend itself to being eaten with fingers. We then spotted handy plastic forks and realised that we could become entitled to one of these by creating salads of our own choosing. Needless to say this then became a challenge, endeavouring to cram as much as possible into the receptacles provided. The downside is that pasta salad probably isn’t the menu of choice when one is cold and wet. We narrowly manage to avoid the noisy fellow passengers on our return trip. One couple have chosen to sit in the wrong seats. This has a knock on effect on other passengers as they search for their allocated seats. We have obediently sat in the seats designated on our ticket, how difficult can that be?